I don’t know why, but this recipe makes me think of Napoleon Dynamite and his aunt yelling at him to make himself “a dang quesa-DILL-a”. Nobody would need to twist my arm to make this quesadilla – scrambled eggs and crisp bacon join melted cheddar and mild green chiles, sandwiched between two perfectly crisped flour tortillas. It beats a traditional bacon, egg and cheese sandwich any day of the week, and the portable nature of pliant triangles of breakfasty goodness make this a prime contender for late-night, post-drinking binge food. Come to think of it, this quesadilla is the perfect reminder that breakfast is good at just about any hour of the day. Making a quesadilla is similar to a grilled cheese sandwich – if you cook the thing over high heat, the outside will burn before the cheese gets a chance to melt. Cook your quesadilla slowly to allow it to crisp up as the cheddar turns into melty gloriousness. Warm a pan over medium heat and add the butter. Slip the eggs into the pan and stir slowly, allowing the eggs to form curds. Shut off the heat while the eggs are still wet and stir in the chiles and bacon. Place a tortilla on a cutting board and top with 1/3 of the eggs. Sprinkle a 1/4 of cheese on top and fold the tortilla over to create a half-moon. Repeat with the rest of the tortillas, eggs and cheese. Heat a large skillet over medium-low and add the olive oil. 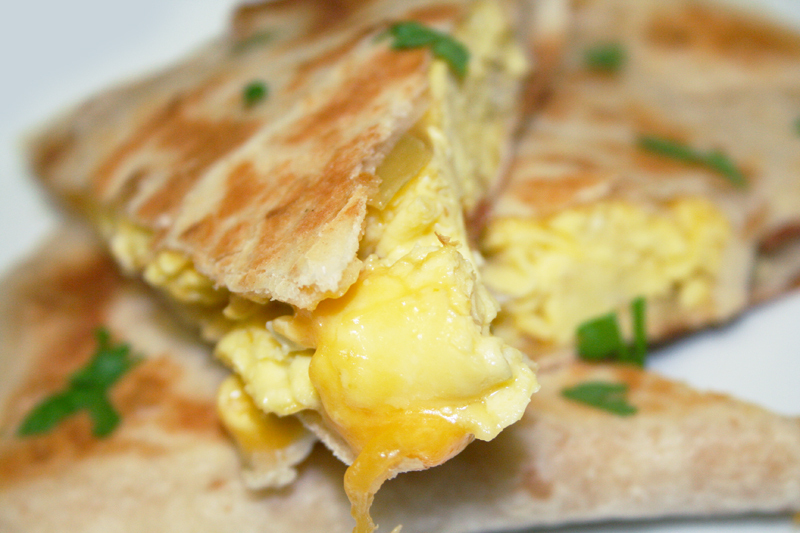 Cook each quesadilla until golden brown and toasted, about 5-6 minutes on each side. Use a pizza cutter or sharp knife to cut each half-moon into 3 triangles. Serve with salsa or guacamole.